How demanding tour — Motorcycle Adventures on The Globe! HOW HEAVY OR LIGHT IS YOUR TOUR? Did you know that in winter, in the north of the country, we have reindeer competitions! But do not worry, we do not have any snow in the summertime when you come. At least not much! ;). Each of our tours from 1 to 4 reindeers is intended to an average biker whatever it means! With our standars it means that you have been driving with a motorcycle for some years and you know what it is to be a biker! But however, there are variations from tour to tour! 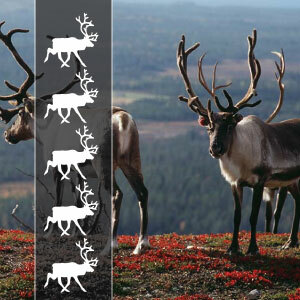 On this page you can see what it means from reindeer to reindeer! This is easy. Short driving days on good paved roads. Very good quality hotels (4-5 stars) and a car for your luggage. In the evenings you will always have a three course meal! And before dinner you have time to relax... time for a drink by the lake, sea or the pool. This is much like the trip with 1 reindeer. Differences are that the driving days vary and are a bit longer. Hotels are 3-4 stars. If there is a luggage car, it is mentioned in the section 'what is including the price'. Km per day between 150 and 350. On 4 reindeer tours we are driving allroad- bikes! The days can be short in kilometers but longer in hours depending on the weather- and road conditions because we are also driving on the gravel roads! Accommodation as on three reindeer tours! These are extreme trips and are made for adventurous and experienced bikers! You will have sometimes long days and always very variable roads from the best to the worst and sometimes there are not even roads ;). If you are coming with your own group, the level can be whatever. We can give you very hard time in extream conditions... or at the other end. We can have a trailer for your bike on 1 - reindeer tour, if you wish to sit a day in a car and drink champagne!